Rule #1: Stop Talking teaches the fundamentals of listening, starting with an explanation of the importance of listening and then delving into listening "rules," which are accompanied by practical guidelines and explanations. Following chapters recognize and work with beliefs that interfere withor "short circuit"listening. 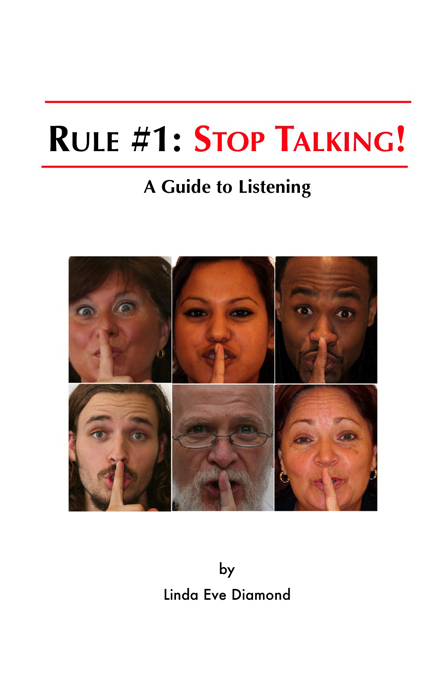 The chapter titled "Talk Talk Talk" takes a light-hearted look at people who talk without pause or concern for others in the room. Why do they do it? Can they be stopped? How can one escape? Though light-hearted, the chapter offers insights and solutions. This leads into a chapter that gives the reader a break from working to be a better listener and offers advice on how to encourage listening in others. It also offers another angle for self-reflection, encouraging the reader to examine situations and communication styles that discourage listening in others. The rest of the book delves into specific listening benefits, such as lie detection, understanding one's self, resolving conflict, listening "in the age of overload," and clearing "head static," such as the racing mind or repetitive thoughts. Here, the book touches on meditation, nutrition, sleep, all of which keep the mind in a better state for focus and attention. The book ends with a chapter titled: "The Touchy-Feely Section," which talks about the deep human need for connection and sums up the importance and impact of listening. Throughout the book, the author incorporates stories and insights submitted from an array of contributors including listening experts and a poem contributed by a former poet laureate. These contributions are displayed in boxes titled "Listeners Speak." The author wants readers to deepen their awareness of this skill and of their own listening habits and blocks. This awareness will help readers change these habits and blocks that interfere with listening, an essential skill for both business and personal success. "Linda Eve Diamond's book is an excellent introduction to Listening as a powerful communication tool. She translates, through listening, the principles of human understanding into the concerns of our everyday lives and encourages the reader to begin their own listening journey and to explore the effects of good listening." "In a world rushing by and filled with so much noise, nobody seems to be listening. Linda Eve Diamond has brought forth a book that opens a door to deep listening,something simple yet powerful to improve relationships,work and well-being. Good lessons and important tools in a busy life." 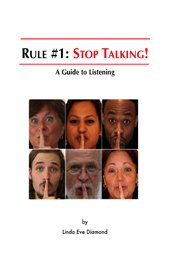 "Linda Eve Diamond writes in a voice that makes it easy to understand the basic concepts of listening. In addition, she adds the practical information about physiology and biology - how it works! I also like her definitions and the techniques she suggests. I think readers will come away with a lot of ideas on how to become better listeners." "With her bright, friendly tone, and practical, commonsensical approach, Diamond eases you into something that's bigger than you may realize. To truly listen is to break free from the limitations of your own concepts and expectations and open to limitless fresh possibilities. Step by step, Rule #1 shows you how." "Diamond's book deserves a good listening to. Human beings are human becomings—works in progress—and Rule #1: Stop Talking is a guide book to becoming more in tune with ourselves and one another." Become a better listenerand encourage others to listen. Open the mind while still being a savvy, critical listener. Nurture healthy relationships and repair troubled ones. Boost customer satisfaction and business success. Listen to yourself to create the life you truly want.